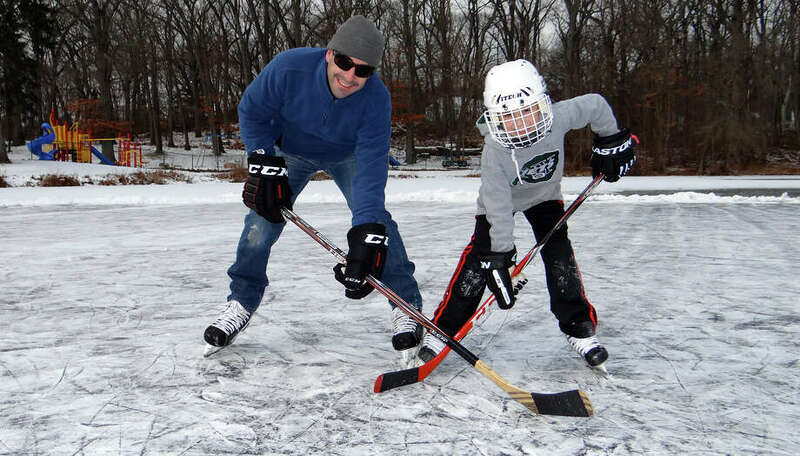 Tim Macklin and son, Max, 9, face off over the puck Sunday at Gould Manor Park. Iced over after a week of frigid temperatures, the pond at Gould Manor Park sprang to life as an ice rink over the weekend. Fathers and sons donned hockey gear to slap around pucks, tykes tottered around trying to gain their ice legs and experienced skaters glided through figure eights. In short, it was a classic New England scene of winter.